In her first year as a farmer, incessant rain left Katie Phibbs with flooded fields, no crops, and a stack of bills to pay. After this challenging foray into traditional farming, Phibbs decided to try a more creative and less unpredictable approach to farming: hydroponics. Phibbs founded The Lettuce People, an urban hydroponic farm in Youngstown, Ohio which grows various types of lettuce, arugula, chard, and basil. Phibbs has become an expert in hydroponic growing systems and has made this expertise a core component of the farm’s business model. farmers and through extensive social media outreach. Much of Phibbs’ success as an urban farmer and educator can be attributed to the research she performed as she developed her business model. For example, Phibbs made a point of examining hydroponic business models that failed, so she could make the necessary adjustments to her own. After realizing that one of the primary factors in failed hydroponic operations was the cost of energy usage from lighting and cooling, Phibbs made some energy-savvy changes at The Lettuce People. outdoor operations and four times more lettuce than traditional hydroponic systems. 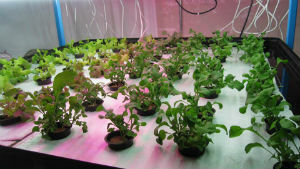 The system uses Philips Horticulture LED lighting and can grow up to 256 plants in a 4 foot square space. self-sufficient, with plans of turning a profit in the next 6 to 8 months. According to Phibbs, the future goals of The Lettuce People relate primarily to education. Phibbs would like to increase the farm’s impact in the Youngstown community by installing salad bars in local schools, hospitals, and nursing homes.